Working as a financial planner or financial advisor brings enough challenges as is, but when it comes to marketing strategies it is easy for mistakes to be made. Marketing strategies need to be executed correctly in order to be effective. At AlphaDroid, we have helped planners by creating an asset allocation software that helps financial planners and advisors with their work. AlphaDroid’s algorithmic trading strategies are based on what is currently happening opposed to the patterns, cycles, or correlations of what might happen. 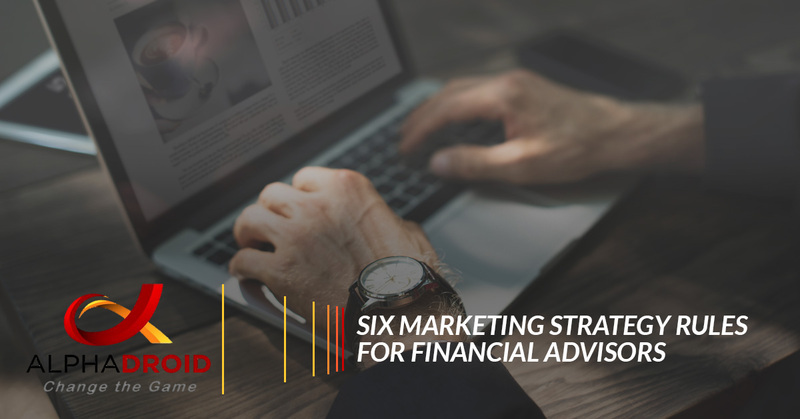 Being experienced in the financial industry, we are going to continue to help financial planners by sharing hard-found knowledge regarding marketing strategies that may help them avoid critical mistakes that could impact them negatively. When it comes to marketing for financial advisors, there are some simple rules that can make all the difference when followed. If you are going to be marketing your firm, it is essential to make sure your existing clients are happy. When you begin effective marketing strategies, potentially new clients will likely be interested in your services. These potential clients may ask existing clients about your services. That said, by providing above and beyond service will not only keep your current clientele pleased, it will give you a resource for picking up new clients. Satisfied clients are likely to offer referrals and will likely lead to new and qualified clients that could be a great match for your financial planning firm. There has once been an argument that marketing is not necessarily important or appropriate for professional practices, like financial planning. This, of course, is not true. For financial practices to succeed, there needs to be new clients brought in consistently. New clients are growth for a firm. Without growth, financial practices will eventually decline — due to death, retirement withdrawals, divorces, etc. Firms that do not experience growth will miss out on beneficial advancement opportunities for young and eager employees. In addition, marketing plays an important role in firm growth. “I saw your presentation a couple weeks ago. I am interested in your advising services. Consistent marketing is sure to bring in some prospects, some of which will be qualified and appealing to your practice. When you are interested in a prospect becoming a client, be straightforward with them, letting the prospects know that you would like them to consider becoming a client. It is important not to push too hard during this stage or it could intimidate the prospects. Invite them to meet at your firm to discuss the details of becoming a client. Once the meeting is complete, communicate how you would really like to work with them. Having clear and candid communication can potentially lead to prospects feeling valued and wanted, which can lead to new clientele. If you have chosen the career path as a financial planner or advisor, it is likely that you plan on staying in the industry for a while. Since this is a long, yet rewarding, career choice it is important for those working within the industry make smart business choices that will make your profession rewarding and add to your happiness. It is important to only pursue clients that will be beneficial to your firm. If you know a prospect will end up causing issues in the future, do not spend time pursuing them. To best enjoy your job, choose clients who you enjoy working with and talking to. In addition, do not join an organization with only the intention to network, join it because you enjoy being a part of it. Figure out what you want your practice to become and make choices that are consistent with that vision. It is also important that your branding and marketing strategies are also steered towards your firm’s vision. Spending time and money on marketing is essential for growth and success. Either time or money, or both are dependent on your growth needs, your allocated budget, and the time you have available. If you have a busy schedule, you should avoid the activities that are time-consuming, like being actively present on social platforms, and steer your focus on more targeted marketing strategies, such as speaking at seminars. However, if you have a low budget, you will need to pursue opportunities that are low-cost, like referrals from current clients and posting on social media. Knowing a few important rules can help ensure that your financial practice marketing strategies produce results and lead to growth and fulfillment down the road. By using AlphaDroids asset allocation software, you can focus more on your financial firms marketing strategies and growth. At the same time, your clients deserve professional account management to proactively capture the best days in the market, while avoiding the worst. Our asset allocation software is a financial tool for advisors and planners to use to provide a systematic and disciplined way to do just that. 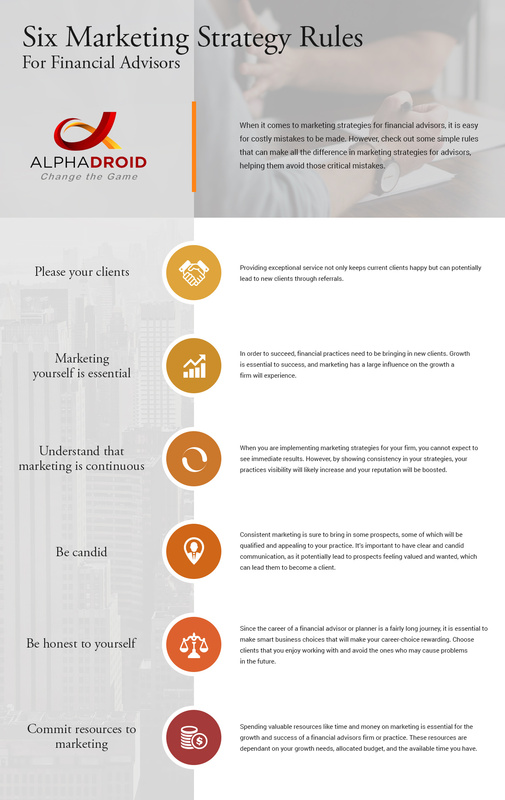 To learn more about AlphaDroid and our algorithmic trading strategies, please contact us!